We review the top 61-key keyboard kits to learn and play digital piano. Keyboard kits under $100 to $150, including stands, headphones, etc. are perfect for beginner to intermediate level piano players. Our buyers guide includes Casio, Yamaha, RockJam, Samson, Joy and more digital piano options. The RockJam 61-Key Electronic Keyboard SuperKit (about $120) includes the keyboard stand, a padded bench / stool, headphones and a power supply. The keys are full-size / standard type that respond to either a soft or hard press (e.g., they are not true velocity / touch sensitive) providing a good action for pressure, response and return. You get 100 keyboard sounds, 100 rhythms, and 50 demo songs. We like the RockJam “Intelligent Teaching” with the integrated LCD Display. It shows the correct keys and chords to press when playing the demo songs, and it indicates at what pace you should be playing. The included AC to DC power supply is great for use at home; For portability, it’s also powered from 6x Size D batteries (1.5V). The headphones are good quality with comfortable ear cushions. They are adjustable, so can fit a child, teen or adult. These are great to use while practicing and playing so that you don’t bother anyone else. You can also play using the built-in stereo speakers, which have good sound quality. The padded stool and stand are both standard quality, and both are very usable. The stand is adjustable so you can securely position your keyboard, as well as set it to where its most comfortable for you. Not included is a microphone, if you (or someone else) want to sing along while playing. There is an input jack which accepts all standard microphones. At just under 20 pounds (19.84 to be exact) and measuring 35.4 x 9.8 x 5.9 inches, this is comparable to other 61-key digital pianos we have looked at. It’s easily portable, even loaded with the 6 batteries. Order the RockJam 61-Key Electronic Keyboard SuperKit from Amazon for about $120 and you can be playing piano in just a few days. The Casio CTK-2550 PPK 61-Key Premium Keyboard Pack (about $130) comes with the stand, headphones and power supply. No stool with this package, but many people prefer their own seating. Keys are standard, full-size with good action and response. 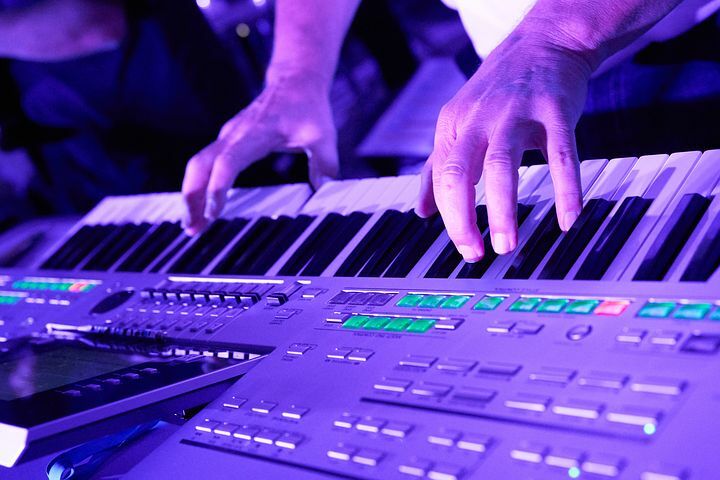 The keyboard has 400 built-in tones, 100 auto-accompaniment rhythms and “Dance Music Mode” with 50 built-in rhythms. The Dance Music Mode lets you create and remix electronic dance music quickly and easily, a feature new for this Casio CTK-2550 release. This combination of Tones and Rhythms are a great way to jump-start your creativity when you are composing your own music, or just practicing. Learn to play with the free Chordana Play app, which when connected with your iOS or Android device uses the CTK-2550’s display to show you how to play your favorite songs. Power it at home or on stage with the included Casio ADE95 Keyboard Power Supply, or go wireless using 6x D-Cell batteries for hours of music. The stand is “X-Style” and made from heavy-duty 1-inch square and round steel. This keyboard stand will hold the 61-key digital piano, as well as 49, 76 and 88-key keyboards with a maximum weight of 130 pounds. It has a secure-lock height adjustment from 25.25 to 38.75 inches, so you can be comfortable in seated or standing performance positions. We like that the stand fully closes for easy storage and features non-marking rubber end caps. It makes for easy transportation, or putting away in a closet when you are done playing. The headphones are Samson HP30 (retail about $25) “closed-cup” style, with comfortable padding. These are lightweight, closed-back design with an adjustable headband. Measuring 37.2 x 12.1 x 3.6 inches, and weighing 20 pounds, you can bring this digital keyboard anywhere you need to play. For about $130, you can order on Amazon Casio CTK-2550 PPK 61-Key Premium Keyboard Pack . The Joy JK-61 61-Key Electronic Keyboard Pack (about $110) comes with Stand, Stool, Headphones, Power Supply and a Microphone for a complete digital piano kit. The LCD Screen shows settings and selections for your current session. It also shows the correct keys and chords to press when playing the demo songs. In addition, it indicates at what pace you should be playing. The Joy JK-61 doesn’t specifically include additional teaching functions, but Joy has developed a number of free Keyboard Training Apps (e.g., “SimplyPiano” or, “PianoMaestro“) that you can download to your iOS and Android devices. Once you create your unique sound function, you can save it to the internal memory for playback later. Both the stand and stool are adjustable, which is suitable for kids through adults to practice and play. The headset is comfortable, and adjustable. Like the other headsets in these kits, the over-the-ear foam cans are suitable for hours of practicing so you don’t disturb anyone around you. The built-in stereo speakers are decent quality, and you can get enough volume for a small room if you want to perform for a small group. For recitals you may wish to consider an additional external speaker. There is an “audio out” jack for this. You get a number of connection sockets for microphone, headphones, and power supply. Joy also provides an additional output jack for an external speaker or second set of headphones. Unfortunately, there is no MIDI connection for this keyboard; But that’s not unusual for beginner type digital pianos in this price range. While similar in size to many other 61-key pianos at 33.8 x 12.7 x 4.1 inches, this is one of the lightest at just 7.5 pounds. Order through Amazon, the Joy JK-61 61-Key Electronic Keyboard Pack (about $110). New – from Amazon #1 best-selling music author Ben Parker, this book is the perfect introduction to the electronic Keyboard for absolute beginners of all ages. This great beginner’s guide also provides an easy introduction to reading and playing music – so whether you have no previous musical experience OR are simply new to the keyboard, this clear and concise guide will have you playing tunes on your new keyboard in no time. Also, the team at MusicAuthority has more information on how to buy the right digital piano. Have a great time learning to play piano, or improving your skills with these 61-key electronic keyboards!